Up with me! up with me into the clouds! With clouds and sky about thee ringing. That spot which seems so to thy mind. Up to thee would I fly. To thy banqueting place in the sky. F the variety of names by which this Lark is known is any indication of its popularity, its friends must be indeed numerous. Snow Lark, Snowbird, Prairie Lark, Sky Lark, American Sky Lark, Horned Lark, are a few of them. There is only one American Species, so far as known. It breeds in northeastern North America and Greenland, wintering in the United States. It also inhabits northern portions of the old world. The common name is derived from the tufts of black feathers over each ear, which the birds have the power of erecting at will like the so-called horns of some owls. In the Eastern States, during the winter months, flocks of Horned Larks, varying in size from a dozen to those of a hundred or more, may be seen frequenting open plains, old fields, dry shores of bays, and the banks of rivers. According to Davie, as there are a number of geographical varieties of the Horned Lark, the greatest uncertainty has always attended their identification even by experts, and the breeding and winter ranges of the various subspecies do not yet seem to be clearly defined. Audubon found this species on the low, mossy and sheltered hills along the dreary coast of Labrador. In the midst of the mosses and lichens that covered the rocks the bird imbedded its nest, composed of fine grasses, arranged in a circular form and lined with the feathers of grouse and other birds. Chapman says these Larks take wing with a sharp, whistled note, and seek fresh fields or, hesitating, finally swing about and return to near the spot from which they were flushed. They are sometimes found associated with Snowflakes. The pinkish grey coloring is very beautiful, but in the Middle and Eastern States this bird is rarely seen in his spring garb, says an observer, and his winter plumage lacks the vivid contrasts and prime color. As a singer the Shore Lark is not to be despised, especially in his nesting haunts. He has a habit of singing as he soars in the air, after the manner of the European Skylark. Range—Breeds in northern Europe, Greenland, Newfoundland, Labrador, and Hudson Bay region; southward in winter into eastern United States to about latitude 35°. Nest—Of grasses, on the ground. Eggs—Three or four, pale bluish or greenish white, minutely and evenly speckled with pale grayish brown. 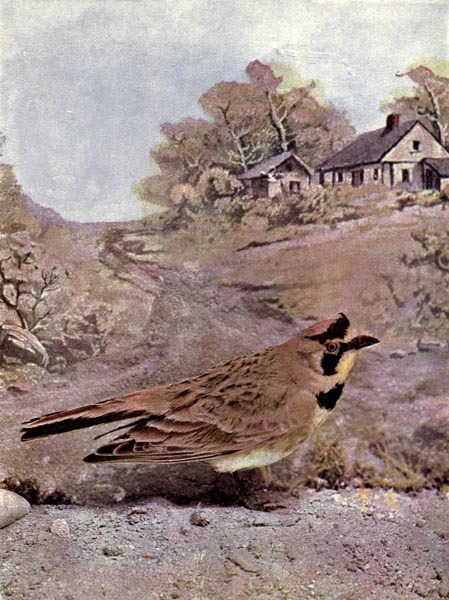 The Horned Lark (Eremophila alpestris) is a member of the Alaudidae – Larks Family. There are 98 members presently in that family. In Europe they are called the Shore Lark, same as the title. 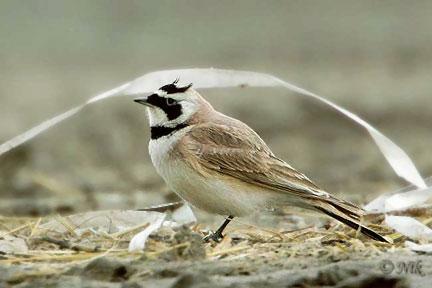 Here we call it today the Horned Lark. Unlike most other larks, this is a distinctive-looking species on the ground, mainly brown-grey above and pale below, with a striking black and yellow face pattern. The summer male has black “horns”, which give this species its American name. America has a number of races distinguished by the face pattern and back color of males, especially in summer. The southern European mountain race Eremophila alpestris penicillata is greyer above, and the yellow of the face pattern is replaced with white. The Horned Lark breeds across much of North America from the high Arctic south to the Isthmus of Tehuantepec, northernmost Europe and Asia and in the mountains of southeast Europe. There is also an isolated population on a plateau in Colombia. It is mainly resident in the south of its range, but northern populations of this passerine bird are migratory, moving further south in winter. This is a bird of open ground. In Eurasia it breeds above the tree line in mountains and the far north. In most of Europe, it is most often seen on seashore flats in winter, leading to the European name. In the UK it can be found as a winter stopover along the coasts and in eastern England although a mated pair have been recently spotted in Windmill End nature reserve in the West Midlands. In America, where there are no other larks to compete with, it’s also found on farmland, on prairies, in deserts, on golf courses and airports, and the like. 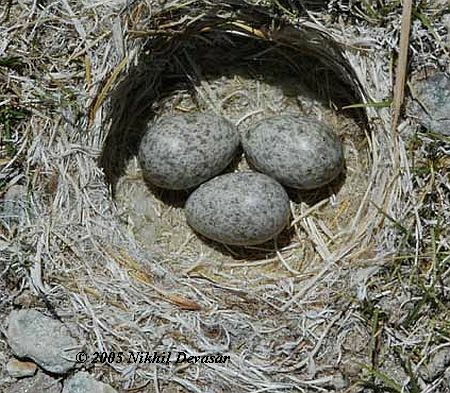 The nest is on the ground, with 2-5 eggs being laid. Food is seeds supplemented with insects in the breeding season. The nest may be near corn or soybeans for a source of food, and the female chooses the site. Vocalizations are high-pitched, lisping or tinkling, and weak. The song, given in flight as is common among larks, consists of a few chips followed by a warbling, ascending trill. This entry was posted in Birds, Kid's Section and tagged Alaudidae, Birds Illustrated by Color Photography, Birdwatching, Christian, From The Past, Home School, Horned Lark, Kids, Nature, Photography, Shore Lark, Youth. Bookmark the permalink. I do love these videos that have the birds singing. There is just nothing quite like sitting quietly and listening to the birds singing — with no other sound to disturb the experience. There’s something so calming about it. I can understand why God chose to refer to birds so often in Scripture to make His points. The other thing that fascinates me when I get a chance to watch birds up close — as in this video — is how they support their entire bodies with seemingly so little effort on two spindly little legs. Thanks for posting these, Lee. I got to thinking today that I hadn’t been hopping around reading very many blogs lately. I’ve been pretty swamped with work and just posting the stuff on my own sites has pressed me for time. I may have been dumb to create three different ministry sites — apart from my authors blog. But each one does seem to reach a certain sector of people, and I just can’t bear to not put God’s words of hope and healing out there in as many venues as possible. Anyway, I’m finally getting around to visiting a little this weekend. Hope your eyes are going well. Got good news and bad this week on the eye. It is healing and can still improve with time and it may not. I have gone from 20/40 to 20/50 in left eye. New lens is helping. Was questioning whether I made right decision to have it, and was assured that with out it, I might have become legally blind in that eye. So, that is good news that I did make a good decision. The Lord knows the outcome of the future for it. “The hearing ear and the seeing eye, the Lord has made both of them.” (Prov.20:12). Thank you so much! I keep “looking” up!